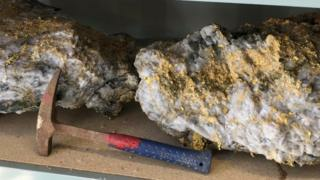 Miners in Western Australia say they have discovered two huge gold-encrusted rocks that are each estimated to be worth millions of dollars. The largest specimen, weighing 95kg (210lb), was found to contain more than 2,400 ounces of gold, Canadian miner RNC Minerals said. The company said it had extracted gold worth about C$15m (£9m; $11m) from a mine near Kalgoorlie last week. One mining engineer described the finds as "exceedingly rare". "People do still record finding nuggets in the goldfields, but typically they are less than several ounces," said Prof Sam Spearing, director of the Western Australia School of Mines at Curtin University. The mining company valued the largest rock at about C$4m. It said the second-largest - a 63kg specimen with an estimated 1,600 ounces of gold - was worth C$2.6m. How much gold is there in the world? The rocks were otherwise made of quartz, the company said. Miners in Australia often extract as little as 2g of gold per tonne of rock, Prof Spearing told the BBC. RNC Minerals said it had extracted 2,200g per tonne. "Very, very seldom do we see results on that level. This is an exceedingly rare find and very exciting," Prof Spearing said. He said that gold particles were often too small to be visible to the human eye. The Beta Hunt mine had primarily been running as a nickel operation until last week's discovery. The company had targeted the gold vein, located 500m (1,600ft) underground, after finding traces of gold closer to the surface in June. RNC Minerals chief executive Mark Selby said the largest rocks would go to auction as collector items.